and ask them if they’ve seen something like that before. Most of them have. In this photo, what do “gun” and “boots” symbolize? Now, their responses are fallen soldier, sacrifice, grief. WOW! 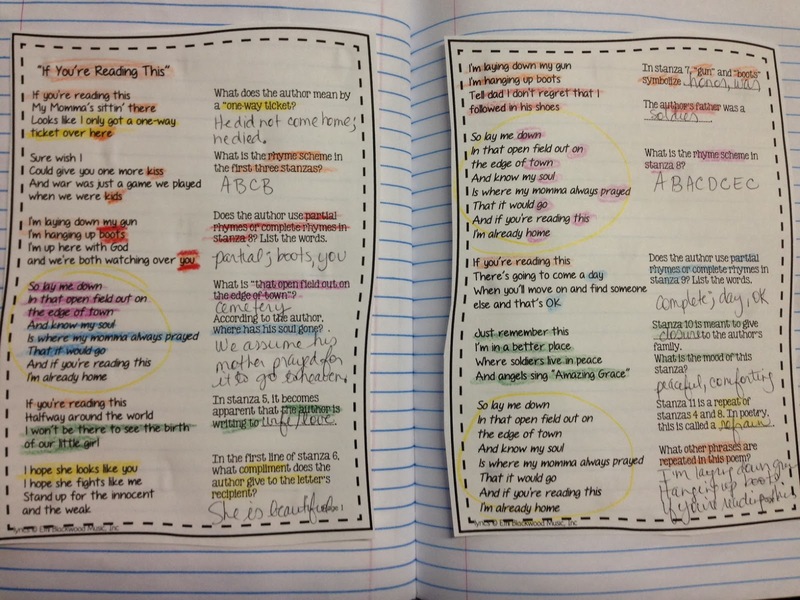 After making a few more inferences about the poem, we moved on to annotating the lyrics, analyzing the poem’s structure with the following poetry terms: rhyme scheme, partial rhyme, complete (perfect) rhyme, stanza, refrain. All of these terms are review from previous years. Have a great Veterans Day weekend! Wow, Erin! I love this idea and I'll definitely keep it in mind for next year. With hubby deployed though, there's no possible way I could get through it this year without turning into a blubbering mess (like I did reading those lyrics just now!). Thanks for sharing! I love the idea of showing the lyrics as a poem before presenting the song to students. I could imagine the great empathy, responses, and connections from the 8th graders. I might try this with my 6th grader, but I would just be happy if they understood the most basic of symbols, which would have to be scaffolded like heck to get there. Still-worth a try- thanks for the inspiration! That sounds like it was an awesome lesson and very meaningful to the students! Thanks for sharing it. My students were also very motivated with your lesson! They had such rich discussion for fourth graders (maybe they're finally maturing!). It was a very powerful lesson and I'm glad you have such wonderful products to share! Thanks for linking up my friend! Another poem you might enjoy incorporating is “Facing It” by Yosef Komunyakka. It contains a multitude of past,present, and future imagery and symbolism in its portrayal of an African American Vietnam Vet who “faces” the Vietnam Memorial Wall. My 7th and 8th graders loved it! The poet does use the word “dammit,” but my students did not dwell on it–they understood the speaker’s struggle with his painful memories and emotions.